China’s richest According to Forbes China list released in October 2010 the number of billionaires soared to 128 from 79 in 2010. There were 42 Chinese billionaires on the 2009 Forbes list. According to Forbes the combined wealth of the 40 richest people in China was $38 billion in 2006---up 46 percent from 2005. Consumer goods, Internet and property tycoons dominated the Hurun Rich List in 2011. Of the 50 richest Chinese on the Forbes list in 2005 half relied on real estate for a substantial amount of their wealth. Of the 100 richest Chinese on the 2001 Forbes list, 73 had their education interrupted by the Cultural revolution and 16 were rabbits on the Chinese zodiac. Only four were signs of the monkey. “China probably now has the largest number of billionaires anywhere in the world,” Rupert Hoogewerf. the compiler of the Shanghai-based Hurun rich list told AP in 2010, “We already know of 189 U.S. dollar billionaires in China this year, but you can safely say that we have missed at least half again, meaning there are between 400 and 500 U.S.$ billionaires.” According to the Forbes 2010 list China was No.2 after the United States, which had 403 billionaires compared to 243 in all of Asia. The billionaires list changes a great deal from year in China , which shows the volatility, dangers and fleetingness of being rich in China. For a while the list was dominated by dot.com magnates, then real estate tycoons and retailers, now paper and solar cells are making their mark. Many who are at the top one year are bankrupt the next. Forbes magazine releases its list of the richest people in China in October. To compile the list, public fortunes are calculated using share prices and exchange rates. For privately held assets, Forbes Asia estimates what they would be worth if public. Forbes ignores "princelings" who have amassed wealth, much of it hidden, though military and political connections. The Shanghai-based Hurun Report is put together by one Rupert Hoogewerf. Hurun calls its list a “snapshot” of wealth. It only includes mainlanders.The magazine Euromoney also puts out a list of the richest people in China. According to Hurun Report, the number of billionaires in China exceeded 100 in 2007 (Forbes counted 66) with 35 of them real estate tycoons. There were only 15 in 2006. China is now No. 2 in the world on the billionaire’s list. The United States has the most. The high number of billionaires is both a source of pride and cause for alarm in China, where many people still earn less than $500 a year and feel neglected and cheated. The entire Hurun Rich List in 2010 named 1,363 people with wealth of at least 1 billion yuan (about $150 million). According to Hoogewerf’s calculations the average age of China’s billionaires in 39. He told the Washington Post. “They are still in wealth-creation mode, focused more on expanding their own company, especially because the economy is growing so fast.” Many of them want to keep a low profile so as not to draw too much scrutiny to their wealth or company dealings. Credit Suisse has estimated that China’s wealthy have up to $1.4 trillion of corruption-tainted cash socked away. Beverage tycoon Zong Qinghou was named the richest man in China on the Forbes China list in October 2010. The founder of China’s largest soft drink maker, Hangzhou Wahaha Group, Zong moved up from No. 3 the year before with assets of $8 billion.Baidu’s Robin Li was listed as China’s second richest man by Forbes in 2010. According to the Hurun Rich List released in October 2010, Zong was No. 1, with an estimated worth of around $12 billion. He moved up from 12th the previous year. Following Zong on the 2010 Hurun list were: 2) Li Li, founder of drug maker Shenzhen Hepalink Pharmaceutical; 3) Zhang Yin,, founder of the paper recycling giant Nine Dragons Paper; 4) Liang Wegen of Sany Heavy Industries; and 5) a tie between Robin Li of search engine Baidu.com and Yan Bin of Ruoy Chai International, whose brands include Red Bull energy drinks. Liang Wengen, 54, Chairman of construction equipment manufacturer, Sany Heavy Industry, is the richest person in China with a net worth of $9.3 billion, moving up from third place last year when he was worth $5.9 billion. Robin Li ranks a close second with a net worth of $9.2 billion, up from $7.2 billion a year ago. Li retains the no. 2 spot he held on the list last year. Coming in third is Liu Yongxing, another self-made tycoon whose Hope Group is one of the largest animal feed maker in China. His $6.8 billion wealth this time helped him jump four runs up the league table from last year when his net worth of $4.9 billion made him the seventh richest in the country. 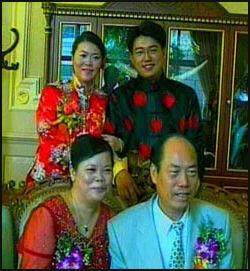 His brother, Liu Yonghao, three years younger at 60, took fourth place with his $6.6 billion wealth. 2010's richest, Zong Qinghou, Chairman of beverage giant, Wahaha, saw his ranking drop to no. 5, with a net worth of $6.5 billion, down from $8 billion last year. Yang Huiyan and Yang Kwokkeung, In 2007, 20 of the 40 names on Forbes magazine list of the richest people in China were there for the first time. The top three were property tycoons whose net work had skyrocketed in the previous year. Others on the list made fortunes when the values of their companies soared during stock-buying frenzies. In 2006, 36 of the 500 richest people in China were women. These included metals trader Chen Ningning and her mother in 29th place, with $800 million; Beijing property developer Chen Lihua, listed at number 25 with $750 million; and Yang Lan of Sunmeadia Investment, a television personality turned business woman with $500 million. By one count six of the 10 richest self-made women in the world are from China. Among the super-rich in the Internet and media world are Robin Li, the CEO and founder of Baidu.com, whose net worth was valued at $2.4 billion in 2007, making him richer than Jerry Yang of Yahoo; Ma Huaten of Tencent.com, worth $1.9 billion; and Jason Jiang, founder of Focus Media, worth $1.1 billion in 2007. Jiang told the New York Times he is motivated by his desire to create the “greatest media company in the world” and says he has no time for anything but work. He works from 8:00am to 2:00am and says he never feels tired. He eats lunch at his desk, usually a $2.50 take-out meal. The fortunes of the rich in China rise and fall like bouncing balls. Online game mogul Chen Tianqiao was worth an estimated $1.05 billion in 2005 when he was 31, after his Shada International Entertainment Ltd went public on the Nasdaq Stock Market and its shares quadrupled in several months. A year and a half later his net worth was reduced by around half after the stock collapsed because of competition in the online gaming industry but he was still worth around $500 million in May 2006. Most of China’s super rich are publicity-shy. They rarely grant interviews and little is known about them or what they do with all their money. Forbes and other business magazines and reports have to hunt to find them. When they do talk they tend to talk more about their $2 haircuts than lavish possessions. Perhaps they are reminded of the old Chinese proverb: Fame portends trouble for men, just as fattening does a pig. 2) Robin Li: Net Worth as March 2015: $14.8 Billion; 2014 China Rich List Net Worth: $14.7 Billion; Founder and CEO, Baidu; Age: 46; Source Of Wealth: internet search, Self Made; Residence: Beijing, China; Citizenship: China; Marital Status: Married; Children: 4; Education: Bachelor of Arts / Science, Peking University; Master of Arts, University at Buffalo; Robin Li on Forbes Lists: No. 62 Billionaires; No. 5 in China; No. 91 in 2014; No. 41 Powerful People; No. 2 China Rich List. Robin Li is the CEO of Nasdaq-listed Baidu, China's largest online search company. Through acquisitions, Baidu has bolstered its wireless business, and it is working full speed on the next generation of search through voice and image recognition. After getting an undergraduate degree in information science, Li obtained a master's degree in computer science in the U.S. in 1994, and worked as a consultant at a subsidiary of Dow Jones. He later joined search engine InfoSeek in Silicon Valley as a senior engineer. Li cofounded Baidu in China in 2000. He has become more involved in politics; in 2013 he became a member of the Chinese People's Political Consultative Conference. 3) Ma Huateng” Net Worth as March 2015: $16.5 Billion; 2014 China Rich List Net Worth: $14.4 Billion; Age: 43; Source Of Wealth: internet media, Self Made; Residence: Shenzhen, China; Citizenship: China; Marital Status: Married; Education: Bachelor of Arts / Science, Shenzhen University; Ma Huateng on Forbes Lists: No. 56 Billionaires; No. 4 in China; No. 80 in 2014; No. 53 Powerful People; No. 3 China Rich List. Ma Huateng, also known as "Pony" Ma, turned Chinese Internet firm Tencent into a giant on the back of profits generated from online games, offering them alongside free services like messaging. Tencent's weChat mobile texting service has attracted nearly 440 million users who are introduced to Tencent's revenue-generating offerings. In the past two years, the company has taken stakes in logistics firm China South City and e-commerce firm JD.com to make more inroads in e-commerce. Ma, chairman and CEO of Tencent, has made good use of his computer science degree, obtained from Shenzhen University in 1993. 5) Li Hejun: Net Worth as March 2015: $30.2 Billion; 2014 China Rich List Net Worth: $13 Billion; Age: 47; Source Of Wealth: renewable energy, Self Made; Residence: Beijing, China; Citizenship: China; Li Hejun on Forbes Lists: No. 38 Billionaires; No. 3 in China; No. 117 in 2014; No. 5 China Rich List. Hanergy Holdings Chairman Li Hejun continues to focus on driving down the cost of thin-film solar technology. After purchasing three Western thin-film solar businesses in 2013, he added a fourth, Alta Devices of California, in 2014, and is benefiting from government incentives for the industry. Li grew up in Guangdong Province, made his early money in the electronics trade in Beijing and started expanding into hydropower. His company runs one of the world's largest privately owned hydropower plants in western China's Yunnan Province. In 2014 he published his first book, "China's New Energy Revolution." 6) Zong Qinghou: Net Worth as March 2015: $10.6 Billion; 2014 China Rich List Net Worth: $11 Billion; Age: 69; Source Of Wealth: beverages, Self Made; Residence: Hangzhou, China; Citizenship: China; Marital Status: Married; Children: 1; Zong Qinghou on Forbes Lists: No. 124 Billionaires; No. 7 in China; No. 94 in 2014; No. 6 China Rich List. Zong Qinghou founded beverage producer Hangzhou Wahaha Group as a store in a children's school in the city of Hangzhou in 1987. Shipments of bottled water and tea drinks remain the core of the privately held company's success and Zong's wealth. Daughter Kelly, the heir apparent, is group president. 8) Lei Jun: Net Worth as March 2015: $13.3 Billion; 2014 China Rich List Net Worth: $9.1 Billion; Age: 45; Source Of Wealth: smartphones, Self Made; Residence: Beijing, China; Citizenship: China; Marital Status: Married; Children: 2; Education: Bachelor of Science in Engineering, Wuhan University; Lei Jun on Forbes Lists: No. 87 Billionaires; No. 6 in China; No. 375 in 2014; No. 8 China Rich List. Known by many as the Steve Jobs of China, black-jeans-and-t-shirt-wearing Lei Jun co-founded fast-growing mobile phone maker Xiaomi in 2010 with his friend and fellow billionaire Lin Bin. Xiaomi has become hugely popular because its phones offer the high power of rivals at a much lower price. A serial entrepreneur, he also chairs gaming company Kingsoft. Its spinoff, Cheetah Mobile, which provides mobile application software, went public in New York in May 2014. Another company backed by Lei, Internet services supplier Xunlei, went public on the Nasdaq in June 2014. He also chairs U.S.-traded YY, a Chinese social site he co-founded. He sits on the board of Wuhan University, where he earned a BA in computer science in 1991. 9) He Xiangjian: Net Worth as March 2015: $10.1 Billion; 2014 China Rich List Net Worth: $7.5 Billion; Age: 72; Source Of Wealth: home appliances, Self Made; Residence: Foshan, China; Citizenship: China; Marital Status: Married; Children: 3. He Xiangjian on Forbes Lists: No. 125 Billionaires; No. 8 in China; No. 190 in 2014; No. 9 China Rich List, He Xiangjian appliance maker Midea Group with 23 locals in the village of Beijiao in 1968. Today the publicly traded company is one of China's largest household appliance manufacturers. He Xiangjian stepped down from daily operations in 2012. In May 2014 Midea raised $60 million in a U.S. debt sale. 10) 10 Liu Qiangdong: Net Worth as March 2015: $7.9 Billion; 2014 China Rich List Net Worth: $7.1 Billion; Age: 40; Source Of Wealth: e-commerce, Self Made; Residence: Beijing, China; Citizenship: China; Marital Status: Married; Education: Bachelor of Arts / Science, Renmin University of China; Liu Qiangdong on Forbes Lists: No. 179 Billionaires; No. 11 in China; No. 642 in 2014; No. 10 China Rich List. Liu Qiangdong's net worth has surged from $2.7 billion in February 2014 following a successful listing on NASDAQ in May 2014 of his Chinese online shopping firm, JD.com, where he is chairman and CEO. JD.com was China's largest online direct sales company in terms of transaction volume in 2013, with revenues of $11.5 billion and market share in China of nearly 47 percent. Liu's first business was a restaurant he operated as a college senior, using startup money he made from computer programming and tutoring students. Although the restaurant business failed, Liu started building the predecessor to JD.com in Beijing in 1998. In 2004 he launched his first online retail website. There are 354 dollar billionaires, up 39 on last year. Ten years ago there were only three, Twelve percent are self-made women, led by Chen Lihua, 73, the most successful businesswoman in the world. Three of the Top 6 speak fluent English: Jack Ma, Li Hejun and Robin Li, demonstrating the globalization of the Chinese private sector. A total of 819 saw their wealth grow (last year 672) of which 343 (last year 115) were new faces. Total wealth comes to US$1.4 trillion, more than the GDP of countries like Spain or South Korea. IT has seen the biggest boom. 5 of the Top 10 are in IT. It’s been a good year for entertainment, investments, cars, renewable energy, pharmaceuticals, manufacturing. It has been a bad year for steel and shipping. Manufacturing and real estate are the primary source of wealth for almost half the list. Social Media. 7 of the Top 10 on the Hurun Rich List are amongst the most popular social media bloggers, showing the huge impact these individuals are having in China. Real estate tycoon Pan Shiyi is the newly-crowned ‘social media king’ with 27m followers, followed by actor and investor Jet Li. Residences: Beijing is the city of choice to live in with 180 individuals living there, 40 more than last year. Shanghai, surprisingly, comes in third behind Shenzhen again. Chinese star signs. It has been a good year for dragons and oxen, and a bad year for rats and pigs. Rabbits lead the way for the umpteenth year. The richest man, Jack Ma, is a dragon, traditionally viewed as one of the most powerful of the Chinese star signs. Wang Jianlin is a horse. Anti-corruption campaign. 18 of last year’s list are in varying degrees of trouble with the authorities, of which 11 still made the list this year. Political appointments. 166 of the Hurun Rich List, up 13 from last year, are either delegates to the 12th NPC or CPPCC. 7 are members of the standing committee of the 12th National People’s Congress, 8 are vice chairmen of the All-China Federation of Industry and Trade. 40 percent of the Top 50, almost triple the average on the list, have senior political appointments.